While the recently detected charcoal rot disease (caused by the soilborne fungus Macrophomina phaseolina) was causing collapse of strawberry plants from various parts of California, a second soilborne issue was simultaneously affecting other fields. Fusarium wilt was first confirmed on California strawberry in 2006. 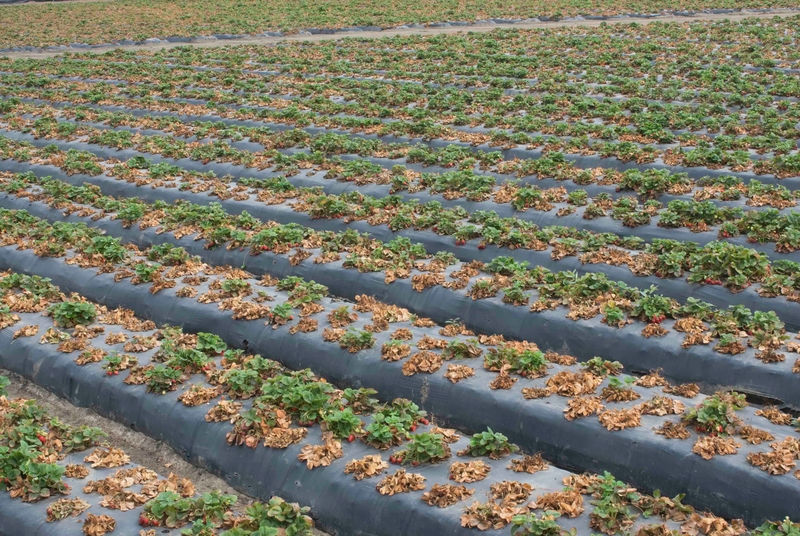 Initially found in Ventura County, Fusarium wilt is now present on strawberry in Santa Barbara and Monterey counties. The spread of Fusarium wilt in the state along with the increasing problems with Macrophomina pose long term threats to the strawberry industry which at present does not have satisfactory plant resistance to both of these pathogens and which is facing a changing future without traditional fumigant products. 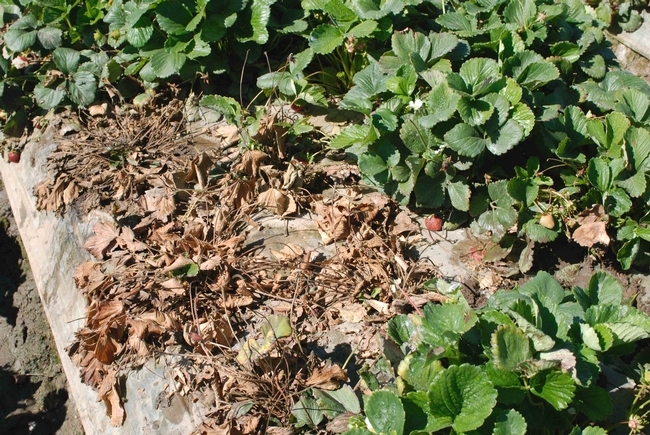 Symptoms of Fusarium wilt in strawberry consist of wilting of foliage, plant stunting, and drying and death of foliage (Figure 1). When plant crowns are cut open, internal vascular and cortex tissues are dark to orange brown (Figure 2). Disease is often most severe if the infected plant is subject to stresses such as weather extremes, water stress (shortage of water), poor soil conditions, or heavy fruit loads. 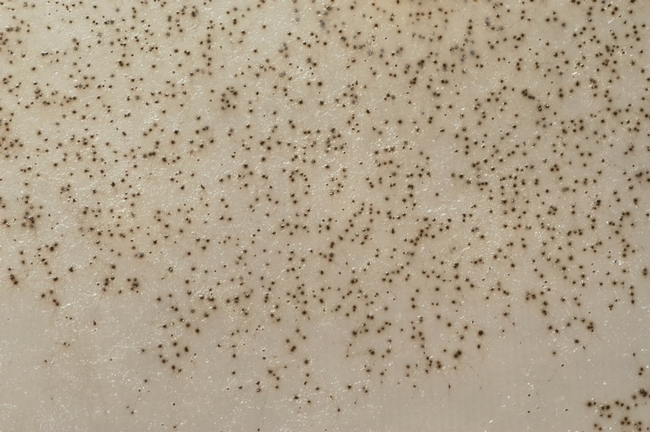 In locations where the disease has occurred for more than one season, the patches can be quite large and appear to have spread from the initial problem area (Figure 3). Such patterns are consistent with the spread of a soilborne pathogen. 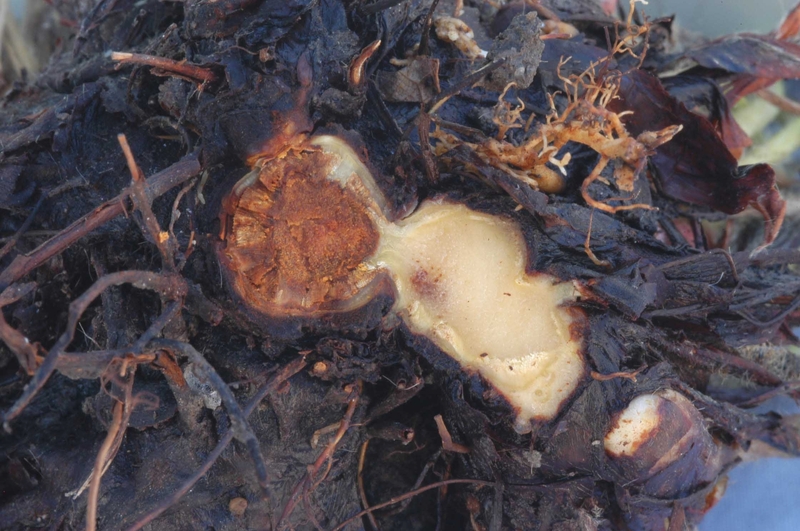 It is noteworthy that in these cases we have never isolated other important, well known pathogens such as Colletotrichum, Phytophthora, or Verticillium. However, it is important to note that Fusarium wilt symptoms are virtually identical to those caused by charcoal rot. 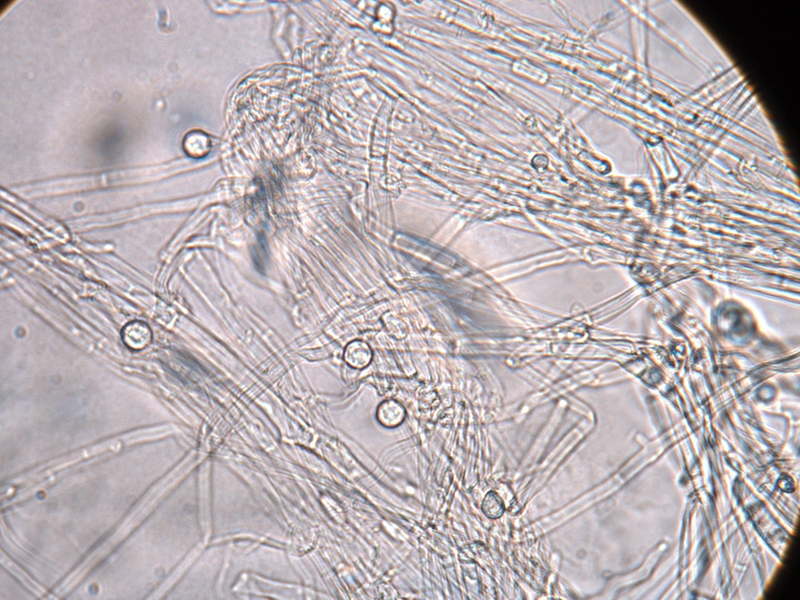 To complicate matters further, in some fields we have found both Fusarium and Macrophomina infecting the same plant. 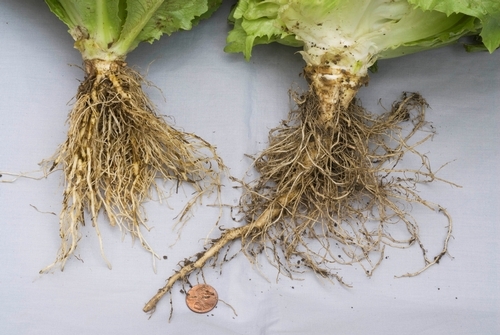 This overlap of symptoms means that growers and field personnel should have plants tested by a pathology lab in order to confirm which soilborne disease they are encountering. 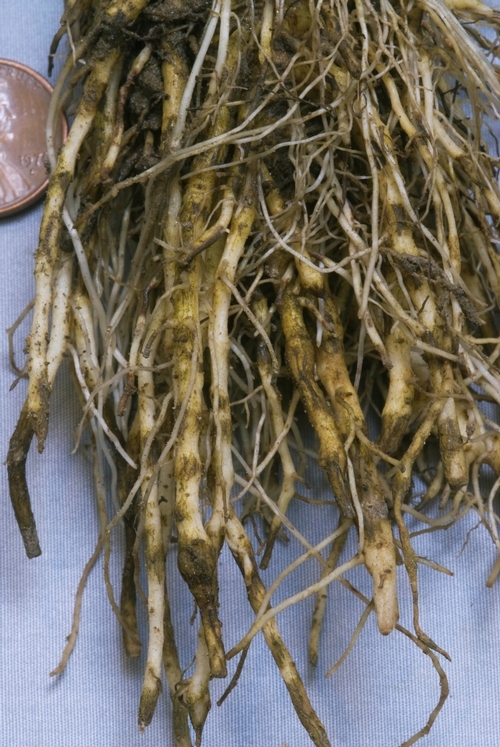 Fusarium wilt is caused by the fungus Fusarium oxysporum f. sp. 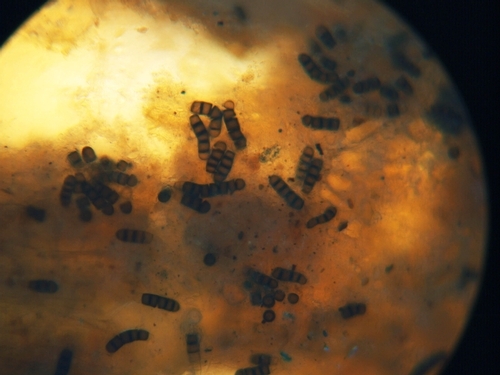 fragariae. 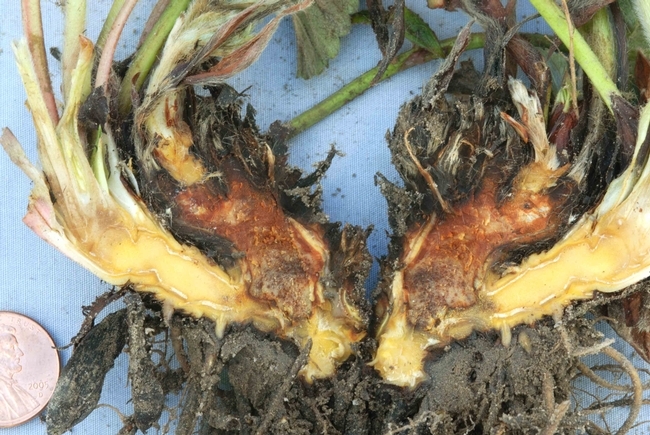 This pathogen is host specific to strawberry and can only infect this crop. The fungus survives in the soil for long periods by producing resilient, microscopic structures called chlamydospores (Figure 4). The development of Fusarium wilt has also been associated with changes in the practices of pre-plant soil fumigation. 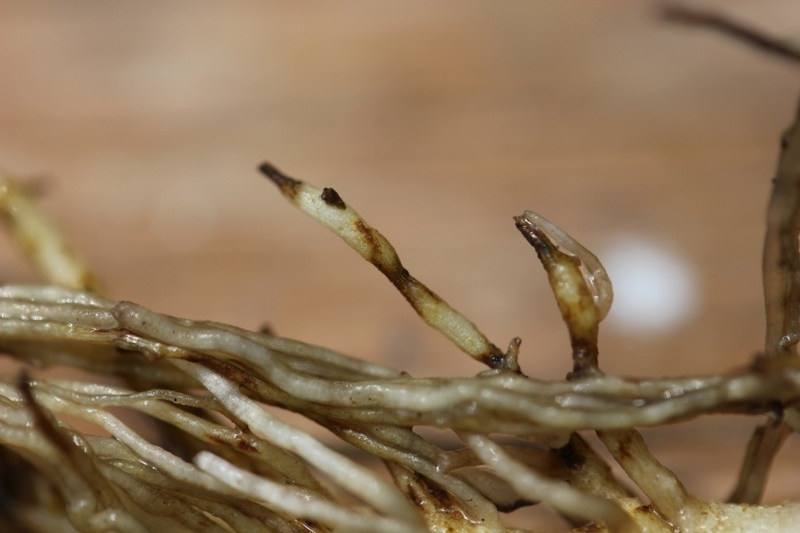 The fungus is spread within and between fields mostly by the transport of contaminated soil during soil tillage and preparation operations. 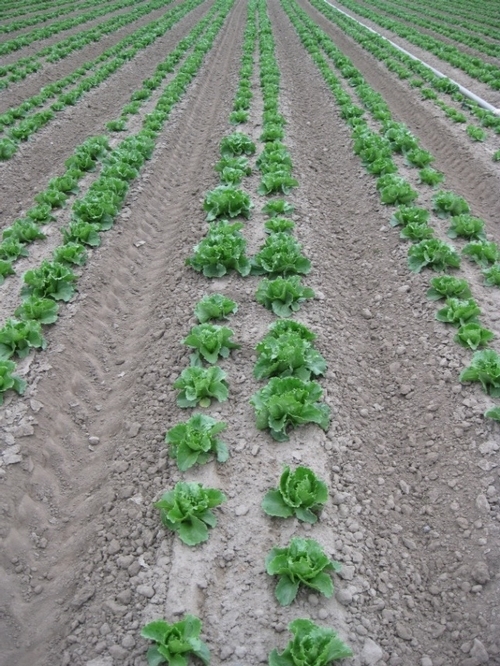 Current management strategies involve the following: (1) Crop rotation. 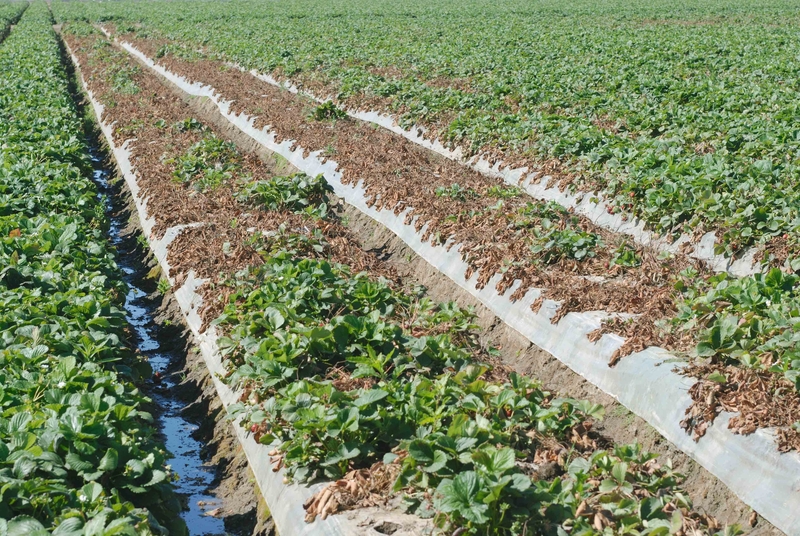 Do not plant strawberry in fields having a known history of the problem and avoid back-to-back strawberry plantings in infested locations. (2) Pre-plant fumigation. This remains a useful tool for managing Fusarium and the other soilborne pests, even though bed-applied fumigants may not provide complete control. (3) Avoid stressing the plants. Stress will hasten the development and increase the severity of symptoms, so use appropriate growing and irrigation practices to reduce stress. Note, however, that even in the absence of stress, infected plants will eventually develop the disease. (4) Sanitation. Growers with Fusarium infested fields need to be concerned with limiting the spread of the fungus from infested to clean fields. Figure 1. 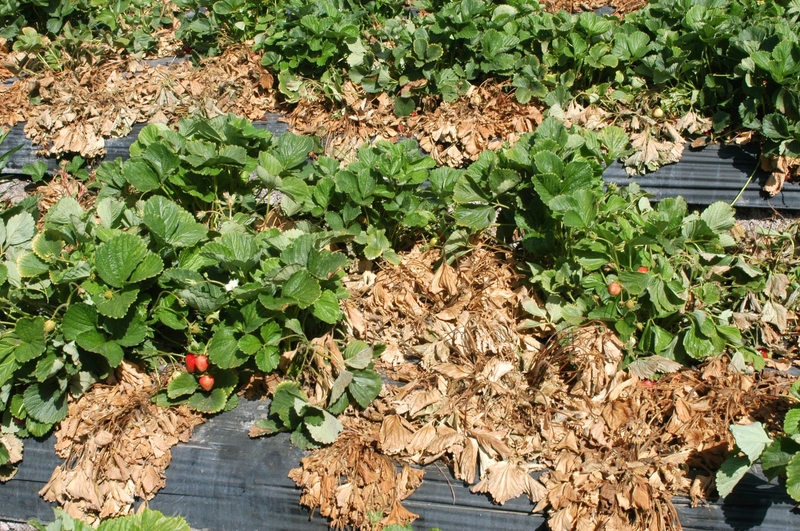 Fusarium wilt results in the collapse and death of strawberry plants. Figure 2. Internal crown tissue of strawberry infected with Fusarium will show a dark to orange brown discoloration. Figure 3. Fusarium wilt can affect large portions of a field and cause significant dieback. Figure 4. Microscopic spherical structures called chlamydospores enable the Fusarium pathogen to survive in the soil.